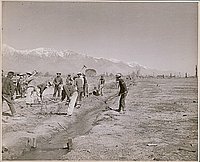 1 b&w; image taken at an unspecified California concentration camp. 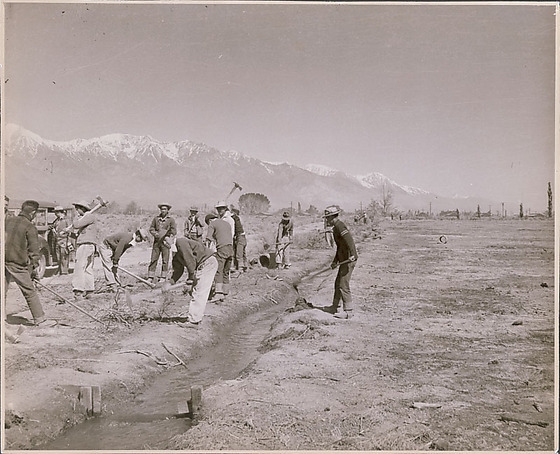 Exterior shot of men digging an irrigation channel. About 12-13 men with pickaxes and shovels digging and clearing brush. They are beside a ditch. Mountains to the left in the background with a little snow. Water is in the ditch. Car parked to the L, man holding a camera is standing next to the open car door. Barracks and utility poles are in the background.